Floating above the city, the house captures more than 180 degrees of spectacular Los Angeles views. Vanity Fair magazine referred to this property as “the ultimate pad; with 20-foot-high panel of windows which provided a stunning view of Hollywood...perhaps the best view in town”. Internationally and widely published Brian Murphy’s architectural tour-de-force of polished concrete, steel and glass. With the indoor/outdoor architecture expressed in pure white, this residence has a sensual quality with all rooms, pool and spa having explosive and seductive views of the entire city below. Murphy tied the house together with a vaulted central space, aimed directly at the downtown Los Angeles skyline. 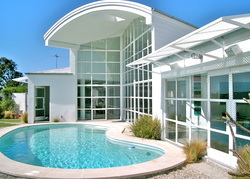 Using the pool as a visual centerpiece, Murphy wrapped the public rooms around it. He extended the roof of the living room over the coping and edge of the pool to capture the reflection of the water on the white ceiling inside. A skylight set into the exterior overhang lines up with three interior skylights, blurring the distinction between the inside and outside. The house consists of a very dramatic and expansive two-story living room, dining room, commercial quality restaurant kitchen, media room and cantilevered library. Located on a cul-de-sac, the property is extremely private to keep the paparazzi at bay - the property is gated and located on a gated, private street in the Sunset Strip. Brian Murphy's educational background is in the studies of art and architecture. He attended UCLA as an art major, then UCLA Graduate School of Architecture. Once dubbed the "Bad Boy of Architecture." Brian Murphy is still at it thirty years later, breaking new ground with his innovative designs and architecture. In his own words, Brian Murphy says that it is for the designer to move ahead, question, challenge and dare...He sees architecture as dynamic and alive...He is eager to provide the client with something new and different, to teach by example and help expand the present vernacular. Good architecture can reflect an elevated spirit.